the girls) We broke into groups of 4 again, one group with the younger girls and one group with the older girls. We strategized and made a lesson plan that we hoped would make the class run smoother. And it did. As the girls walked in we asked them to remove their shoes, place them against the wall by the door and then join us in a circle. This was immensely helpful in structuring our class. The girls listened throughout the entire class. We used our imaginations and played games that incorporated the new choreography. About a third of the way into the class I could tell that something was different, in the best way possible. I have been on 3 exchanges prior to this and have never seen the Malambo girls behave so well. Each girl was engaged, challenging themselves and feeling that sense of accomplishment we strive for. The girls were quiet when necessary, they were dedicated and did what was asked of them. I was truly amazed and impressed by each and every one of them today. Their smiles and light in their eyes showed that they were proud of themselves as well. Today reminded me of how powerful dance is. Luz, an 11 year old girl, was found crying today prior to our class. When Kimberly (the Movement Exchange director) asked her what was wrong she did not say a word, but she did get up and come down to our dance class. She was helpful and had fun with the choreography we taught. After the class was over we had time to play. Luz asked to practice another dance with her group. Before the rest of the girls returned, she was dancing by herself. Luz lit up today. She expressed herself through her movements. She used dance as a vehicle to connect her mind and body while working through her troubles. The pure happiness on her face while dancing and playing together was powerful to experience. Dance has changed her life. Furhermore, during our reflections tonight Kimberly told us that there was a group of 50 baseball players from the United States that were there at the same time as our class. As Malambo is an all girls orphanage from toddlers up, the girls tend to get easily distracted with having men around and desire their attention. Kimberly went to get any of the girls for our dance class from the group of baseball players. While there she overheard one of the girls, Maricruz, speaking with another girl from our dance class. The other little girl wanted to stay and play with the men. Maricruz explained to her that those men were only there for one day, that they did not care about her and the other girls in the way that Movement Exchange does. She explained that they would not be returning and that we have the annual show on Friday therefor it is important to practice. Maricruz told her friend that the Movement Exchange dance teachers were waiting for them. When Kimberly told us this I got chills from head to toe. 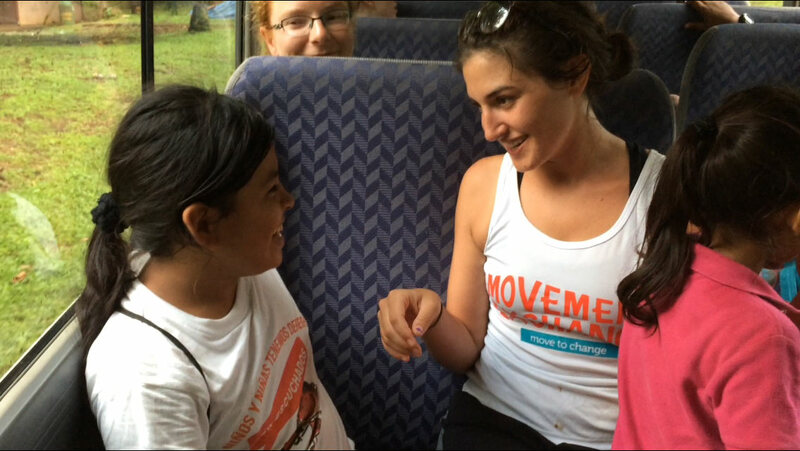 That conversation confirmed our purpose at the orphanage through Movement Exchange is important. It showed how important our sustainability is. Maricruz can feel how much us dance diplomats care about her and the rest of the girls. In addition, her statements showed that she cares about us as well as dance. Her statements showed she is developing in crucial ways through dance. Tears filled my eyes thinking about this young girl explaining to her friend why it was important to go to dance class. No one has told her to say this, no one has explained to her that we at Movement Exchange are here for that exact reason. She showed that we are making a positive impact through dance. That our cause is worthwhile. Today the girls showed incredible growth and improvement. They showed the most dedication and desire to learn and dance I have seen in all of my years with Movement Exchange. I cannot put into words how incredibly proud we are of what these girls accomplished today. Movement Exchange and the Malambo girls took a huge step forward today. We are looking forward to the annual show on Friday more than ever after today’s class. Such a well written ode to these wonderful children, so much emotion I feel it. Thank you for posting Jillian!